training, human leadership, and working as a team. My mom explains the difference between a therapy and service dog, the responsibilities of dog ownership, and the importance of consistency and bonding. A fun and informative read for anyone who loves dogs! A portion of the proceeds is donated to rescue groups, shelters, and dogs in need. 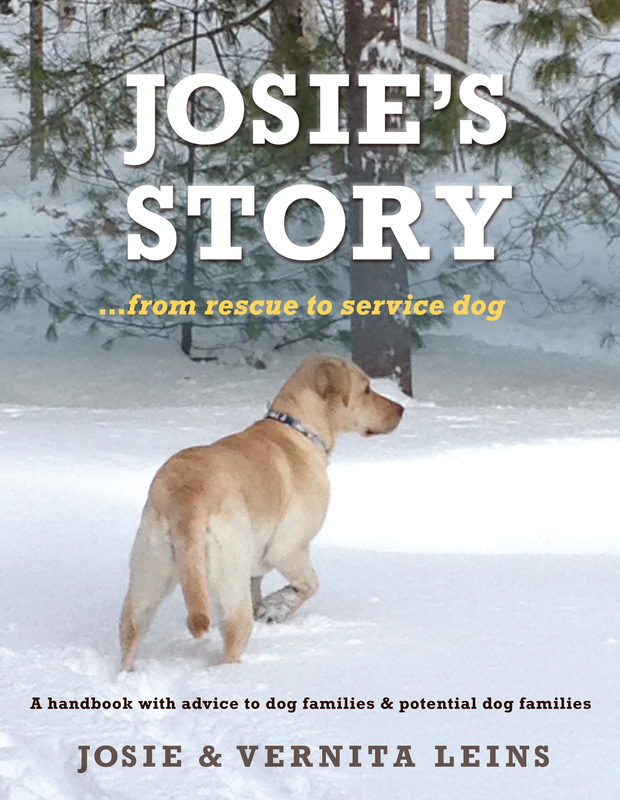 Josie’s Story is a wonderful first ‘person’ account of what it is like to be a support dog. A natural therapy dog from the very beginning, Josie explores that special connection between humans and pets from a unique perspective. After nearly 30 years as a veterinarian, I can recommend anyone considering bringing a dog into their life read this captivating book. Josie’s Story reminds me of my now-gone sweet St. Bernard. I am so proud of Josie finding her words, and for being so willing to understand ‘human’ when it really counts. Her story is particularly sweet because she serves to remind us all that much more lies beneath the cover (fur). Josie, a yellow Lab, lives happily with her family on a pond. When she is not serving as a therapy dog or working in a service capacity, she loves just having fun! Vernita Leins lives in the country with her husband, Robert, and Josie. She enjoys gardening, long walks, canoeing, and qigong. She is retired but currently a massage therapist.